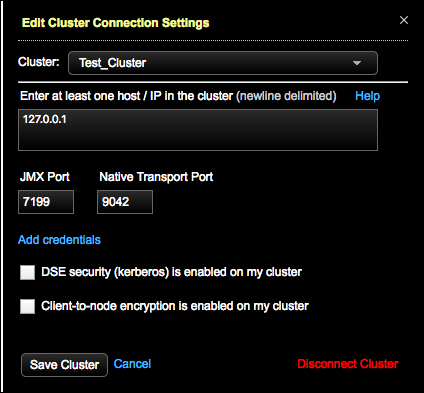 The connection settings for a cluster define how OpsCenter connects to a DSE cluster. For example, if Kerberos authentication or client-to-node encryption was enabled on a cluster, you need to specify that information in the cluster connection settings. 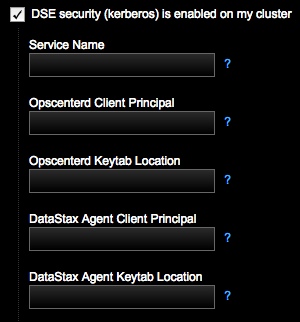 Select the cluster to edit from the Cluster menu in OpsCenter Monitoring. Click Settings > Cluster Connections. The Edit Cluster Connection Settings dialog appears. Tip: Select other clusters to edit connection settings for from the Cluster list. If applicable, change the IP addresses of cluster nodes. 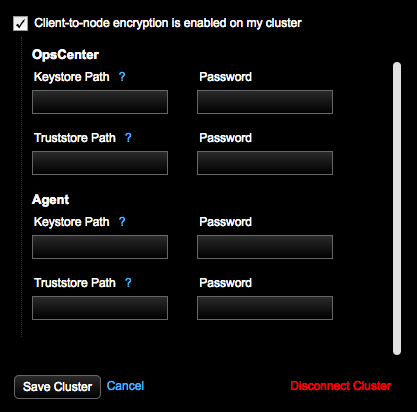 If applicable to your environment, select Client-to-node encryption is enabled on my cluster.